If tracking your health is one of the new things you are working on at the moment, then you need to be aware of the current smart scale fitness tracking products on the market. For instance, fitbit aria and Garmin index are some of them which not only do they track your body fat, weight and heart rate but also they instantly upload the data to your preferred fitness app. It is however not an easy task arriving at the best fitness tracking product that’s why you need to read through this fitbit aria vs Garmin index editorial to have a background knowledge on the right smart scale fitness tracking product. In terms of connectivity; Fitbit aria will instantly upload your data to the fitness app of your choice through WI-FI alone but Garmin index will connect to your fitness app either through Bluetooth, ANT or WI-FI . Moreover, fitbit aria costs less than Garmin index in that; Fitbit goes for $128.47 whereas Garmin index goes for $ 149.99 on Amazon. Fitbit aria does not record a lot of metrics as much as Garmin index. For instance Fitbit aria can record a maximum weight of 350 lbs whereas Garmin index can accommodate a maximum weight of up to 400 lbs. Additionally, Garmin index measures both muscle mass and bone mass which Fitbit aria does not measure. And when it comes to display of the metrics, Garmin index has a larger display compared to Fitbit aria. With the above information be sure to make the right choice on a smart scale fitness tracker. 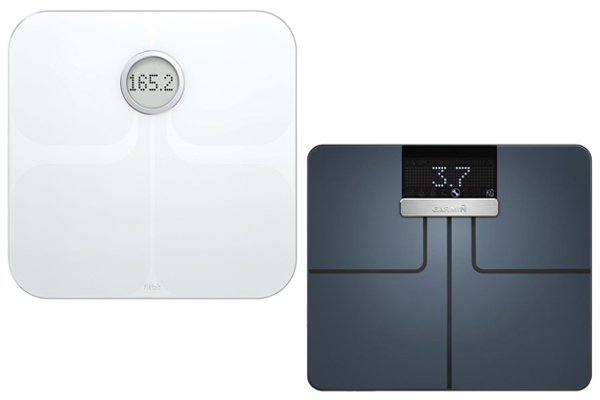 In reviewing the two smart scale fitness tracking products; Fitbit aria vs Garmin index, it is no doubt that Garmin index is better than Fitbit aria because aside from the above mentioned best features, Garmin index also is easy to set up since it has a quick set up process unlike Fitbit aria which has an annoying set up process.